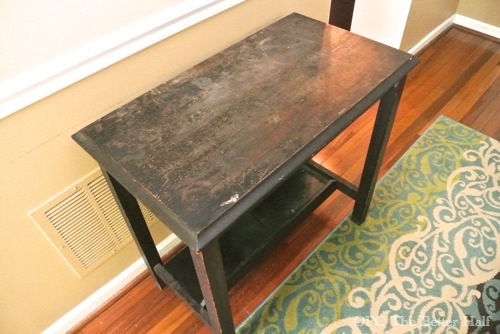 My grandmother gave me this hallway table 7 years ago when she moved and it has sat in our entry hallway ever since…and not looking good, I might add. But this week, she got a much-needed makeover and now looks pretty eff-ing amazing. Here’s how the table came to us. It was super rickety and wobbly, not to mention scratched up. My grandmother came a few months ago and was shocked that we had kept it all these years since it came in such bad repair. Fortunately, the table has sat in a somewhat dark hallway that I haven’t done much work on. Eventually, I’d like to paint the hallway to brighten it up, but it’s not high on the priority list. 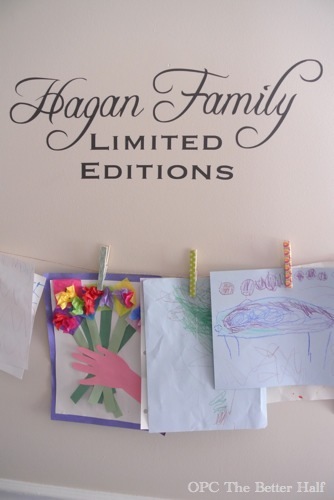 A few months ago, I did update the hallway with a Kid’s Art Display that says “Hagan Family Limited Editions.” It’s super cute, but has drawn a lot more attention to my hallway (and table) than I would like. lol. 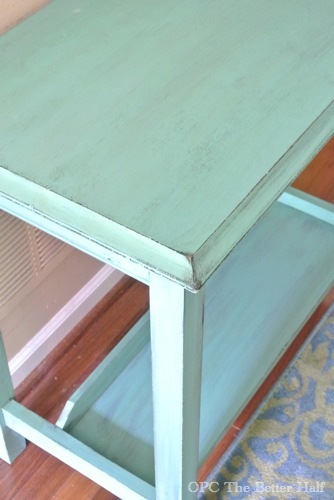 To get to the real point of the post finally….I decided to paint the table. 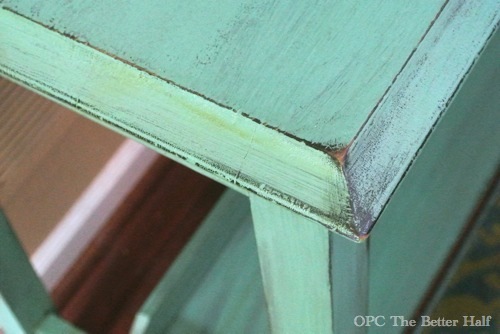 While Ethan tightened some crews and fixed the wobble, I mixed up some paint using the teal color from the living room and adding a bunch of Kelly Green. I turned out really pretty but I’m not sure exactly what color it is. haha greenish blue? Blueish green? Peacock Green? I used a dry brush on top of the clean surface and only used small bits of paint at a time to allow the dark color underneath to show through. After it dried, I sanded the high points and edges, then put a coat of Rust-Oluem’s Ultimate Polyurethane in Matte Finish. BTW, totally in love with Matte Poly!! I don’t use poly on white furniture because it yellows over time, but on anything else, it is fabulous! And here it is in the hallway. I hope my grandmother likes the updated look! What do you think? What name would you give this color? 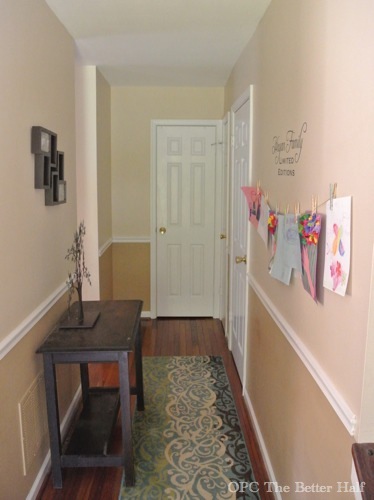 As Always, thanks for reading about my hallway table…and don’t forget to join us every Thursday night this summer for our Before and After contest supporting Habitat for Humanity! oh i love it! that color is gorgeous!!! 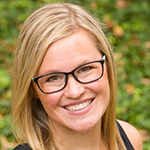 LOVE that makeover and your DIY color! I’d have to go with Mintalicious! Great job, Jocie! It looks lovely in your hallway. I’d name the color sea glass. What a great improvement. 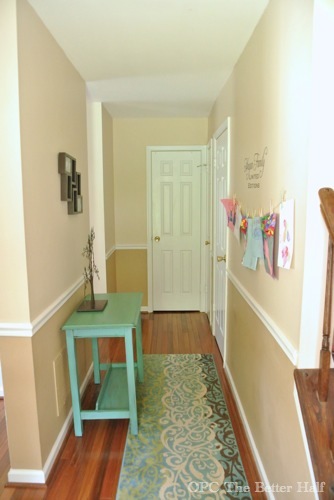 I like how it brightens the hallway and adds color! Wow, it looks great- perfect with the rug. I love the Limited Editions art wall, too- so clever! Wow! What a difference! A great colour. Oh so much better in blue. It really sets off your hall. It looks wonderful! I am sure she will love it. Great tie-in with that pretty rug too!! That’s the same table?! No way! It looks great! Wow painting this table really brought out the color of your rug. It brightened the area perfectly. I too love the gallery wall of your darling daughters art. 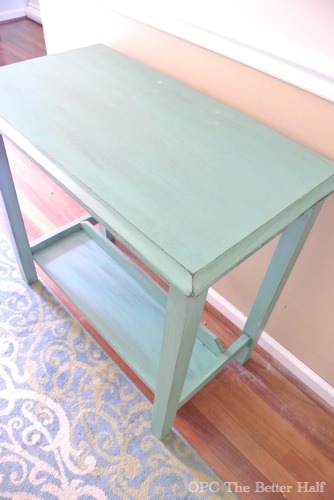 That table had great bones and now it has a killer color to match! Pinning! I love it. It’s like a beautiful verdi gris color. I used that Rustoleum matte finish on my last project. love that too. LOVE how the color turned out! It’s a great pop of color in the hallway. Great choice! I love the way the color turned out, still very much on point… I’m a big fan of throwing it to the wind, and doing a little leftover paint mixing, sometimes too. Haven’t tried a Matte poly but will certainly look for the opportunity. 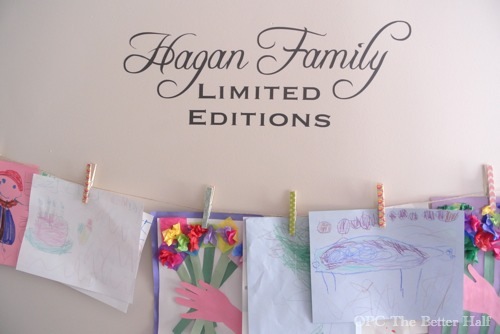 bonus points for the Hagan Limited Edition wall. gonna pin now. ‘Seafoam’ for the color. Very nice!